Traditional societies usually soak or ferment grains before ingesting them. This process will neutralize phytates and enzyme inhibitors and, in a way, predigest the grains so that all of their nutrients are more available. The phosphorus in the bran of whole grains is held up by phytic acid. Phytic acid joins iron, calcium, magnesium, copper and zinc in the intestinal tract, blocking their absorption. For this reason, many people who are allergic to grains will tolerate them well, when prepared properly. Whole grains that have been processed by high heat and pressure, like puffed wheat or rice cakes, are actually very toxic and have caused death in test animals. Breakfast cereal has been heat and pressure treated to make those little flakes and shapes…all breakfast cereals should be avoided. Most importantly, through the heat and pressure treating, most nutrients are destroyed…including phytase, an enzyme that breaks down some of the phytic acid in the digestive tract. Genetically modified grains contain foreign proteins that are irritating to the digestive tract. Please take care in purchasing your grains and legumes. Grains are best when organically grown. Be careful to check the ingredients label for foreign ingredients. “Enriched” flours will contain additional vitamins and minerals that are not derived from food and are difficult to digest and for the body to absorb properly. Whole, organic, freshly ground grains will contain the highest levels of nutrients. Sprouting, soaking and sour leavening are three ways we can accomplish “predigestion” for grains to keep the phytic acid at bay. The method for spouting all grains is the same…only the length of time needed varies. Cover with water, soak, drain, rinse, rinse, rinse, rinse. Once they have sprouts…they can be steamed and eaten, dried and ground for use in baked goods. I love my grain mill (thanks Mom and Dad!) but I know not everyone has one. Another way to accomplish predigestion is soaking the already ground grain. Soak equal parts of flour and water for at least 7 hours…then use. As you can imagine I have had a difficult time changing my recipes to suit a “wet” flour. I am still working on the perfect cookie. 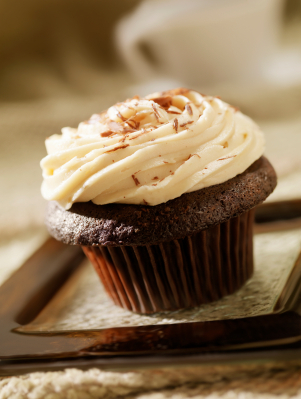 But in the mean time I have a wonderful recipe for Chocolate Cupcakes with Whipped Marscapone Cream. Combine first three ingredients in a ceramic or glass bowl, stir until combined, covered with a cloth for 7-12 hours. Pour off the layer of water on top just before using. Preheat oven to 325 degrees. Cream butter and sugar. Once thoroughly combined and creamy add one egg at a time until just together. Add the remaining ingredients and the soaked flour and stir together. Line cupcake pan and fill almost to the top. Bake for about 30 minutes or until toothpick comes out clean. Whip cream to stiff peaks. Add remaining ingredients and mix well. Top cupcakes and enjoy! I prefer to heat my food on a gas stove using stainless steel cookware. Aluminum will “leak” into the food which research has showed to be linked to Alzheimer’s disease. Cast iron skillets and stoneware are musts in every kitchen. Using these items on the stove or in the oven to reheat food, I found to be the most efficient and safe for me and my family. Another piece of equipment that is fairly new is the pressure cooker. Foods are cooked far too quickly at temperatures above boiling point. Traditional recipes always call for long, slow cooking. There has not been any research done on the long term dangers of the pressure cooker. 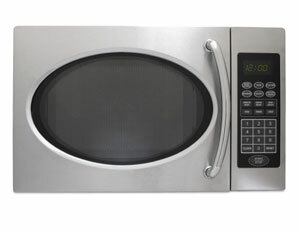 One of the best ways to start eating healthier is to stop using “convenient” kitchen appliances. Start reheating on the stove top or in the oven. Get rid of hazardous coatings on pans and use stainless steel, stone or cast iron. My most recent kitchen gadgets include a grain mill for fresh, rancid free flour for baking; a handheld blender for making creamed soups right in the pot and the next will be a yogurt maker or dehydrator. If there is a question in my mind as to whether an item is safe to use I ask “How much will this item denature my food?” I want that answer to be zero. According to the Weston A Price Foundation we should drink half of our body weight in ounces per day. For example, a person weighing 100 pounds should drink at least 50 ounces of pure water every day. Beverages do not count towards your water intake. Soda, tea, coffee, juice and alcohol are dehydrating beverages. If you chose to enjoy a beverage that is dehydrating you should always rehydrate with pure water of a ratio of 12 ounces of water for every 8 ounces of beverage consumed. Water should be as pure as you can make it. I use a water purifier that connects to the faucet and pumps the water through a filter for clean water for myself, friends, family, pets and house plants. Leaving water in a bowl or jug uncovered for 4-12 hours will remove the chlorine from the water. Dehydration can cause a variety of issues including depression, anxiety, cravings, and more. Water is just as important as food in proper nourishment. It’s important to know what you put into your body. Read the nutrition labels on everything you buy. After a short time you will see that soy is in almost anything that has more than a few ingredients. It’s also goes by many other names. The soy produced is mostly genetically engineered, making its components weak and lacking vitamins and minerals. Corn is also produced in a similar way. Our bodies cannot digest these. Stay away! When I go shopping, I keep in mind that I want to prepare all of my food from its purest state. Buying as much as I can fresh, raw and organic. Anything I can not get fresh, I always read the labels. Stay away from ALL additives. MSG can go by many names also. Additives and sugars can destroy your body. Making any nutrients you do eat difficult to absorb. There are many oils that are put into foods. You want to stay away from most of them. Oils that are cold or expeller pressed will retain the nutrients and enzymes needed for our bodies to properly digest. But also remember to think about where the product came from. Is it from a trusted source? Keep these things in mind the next time you go to the market. Also, shop at your farmers markets and local grocery stores. Whole Foods carries almost anything I cannot get at the farmers market. They carry many local foods that are made with your health in mind.